Jose Jorge Beristayn Schultz was born on August 20, 1894 in Buenos Aires, Argentina. He started studying to become a doctor but left his medicine studies to start painting after encouragement from his friends Mazza, Rossi, Lopez Buchardo and Quiros. 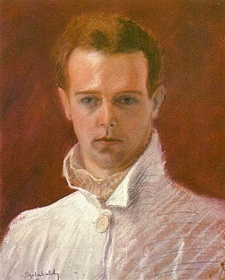 In 1919, he exhibited for the first time at the Salon Nacional. He studied arts in Milan, Roma and the Netherlands. Back in Buenos Aires he got a BA in Diplomatic Studies and continued his work as a painter gaining notoriety with his portraits. In 1927 he was recognized by the Salon Nacional and the year after that he got two awards from the Argentinean government. He was also recipient of several international accolades like the gold medal at the Paris International Art Exhibition and one more in Chile in 1939. He exhibited numerous times in Buenos Aires and abroad and in 1931 he was named director of the Fine Arts Institute of Argentina. He died on October 15, 1962.